The end of the First World War in 1918 was also the end of the Austria-Hungary Empire. As a result of the plebiscite in 1938, the Republic that was formed in 1921 ended through the Nazi-regime in Germany with the annexation as 'Gau Ostmark'. After the Second World War during which Austria was occupied by allied troops, they regained their complete independence in 1955. 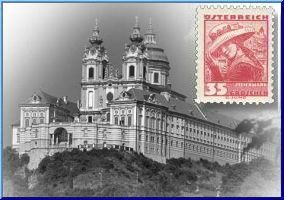 Due to the stability of the Shilling, also called 'Alpendollar' (dollar of the Alpes) before the introduction of the Euro, and because of the responsible expenditure policy of the Austrian Post, those stamps are counted within the most popular of the world and are considered to be a safe investment. All Austrian issues from 1900 to this day are available in our shop and can be ordered immediately.